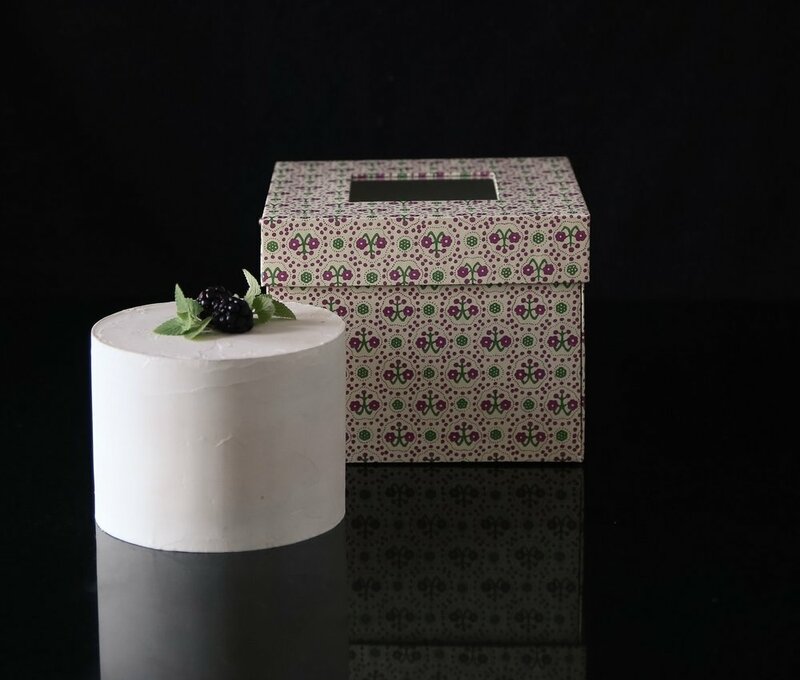 Cakewalk by Elizabeth Hodes is a new line of petite cakes delivered in exquisite, handmade gift boxes. Offered exclusively in Manhattan*, Cakewalk features our favorite flavors chosen from Elizabeth's most loved recipes. Menus change seasonally and range from classic chocolate raspberry to spicy and offbeat candied kumquat with star anise. Layers of moist, rich chocolate cake alternate with smooth mocha buttercream and dark chocolate ganache infused with espresso. Earthy cacao nibs add a nutty texture. This cake is a sensual and intriguing combination of textures and unusual flavors. Each bite reveals an explosion of picante citrus, crunchy toasted nuts and creamy vanilla bean buttercream tinged with smokey cognac. Paired with a caramelized apricot sauce, this deeply flavorful cake is loaded with fresh ginger and spices. Using the finest decorative art paper and traditional bookbinding techniques, Cakewalk boxes are handcrafted in our Manhattan studio. These luxurious, collectible boxes will serve you long after the last slice of cake has disappeared. Please note, all cakes contain one or more of the following: wheat, eggs, nuts, seeds, dairy. *Cakewalk delivery is currently available south of 96th Street, excluding Roosevelt Island. Delivery is included with your order. How many people does each cake serve? Cakes are 5" in diameter and serve up to 8 people. It's up to you who gets the biggest slice. Where do you deliver? Cakewalk currently delivers in Manhattan to any address south of 96th Street, excluding Roosevelt Island. Should I refrigerate my cake? We encourage you to eat your cake within several hours of delivery. If you wish to wait longer, please refrigerate. Flavors are best enjoyed at room temperature; remove from your fridge about an hour before serving. How much in advance should I order Cakewalk? We recommend that you choose your cake(s) at least 48 hours in advance, as supplies are limited. What if I need to cancel or change my Cakewalk order? Because Cakewalk cakes are made to order, cancellations need to be made at least 24 hours prior to scheduled delivery in order to qualify for a refund. If you need to adjust your order, give us a ring at 212.942.6000 and we will do our best to accommodate.